The United States probably has the most food days (informal celebrations dedicated to certain types of foods and dishes). For example, September 7 is celebrated here as National Salami Day. 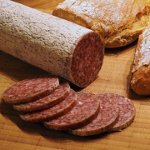 Salami is a type of cured sausage made from fermented and air-dried meat. The word “salami” was derived from the Italian word “sale” (salt) and originally meant all kinds of salted meats. Today, the word “salami” specifically means only one kind of sausage. It can be made from pork, beef, venison, horse meat, donkey meat, and poultry. Most often though, salami is made from beef or pork (or their mix). Salami is believed to have originated from Southern and Central Europe. This type of sausage was very popular among peasants because its stores at room temperature for more than a month. Salami was brought to the United States by Italian immigrants and quickly became popular among American consumers. National Salami Day was created by Virginia and Christina, two friends from Henrico, Virginia. They founded the Salami Appreciation Society (SAS) that started Salami Day. The first celebration was held on September 7, 2006. If you want to celebrate the holiday but don’t know where to start, here’s the easiest option: buy several varieties of salami at your local grocery store and throw a tasting party for your friends and family.